Looking for Air Plants aka Tillandsias? 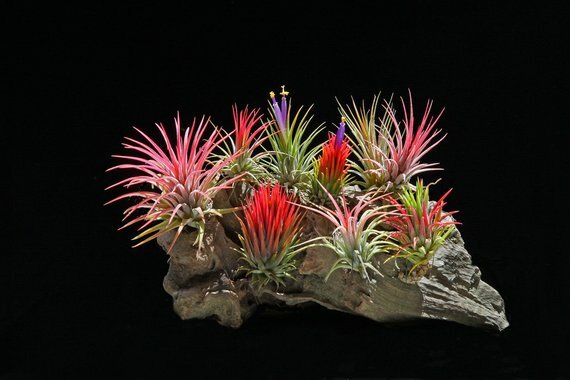 Tillandsias are commonly found in the forests, mountains and deserts of Central and South America, the southern United States and the West Indies. They normally grow without soil while attached to other plants. Some have no roots while the thinner-leafed varieties grow in rainy areas and the thick-leafed varieties in areas more subject to drought. Most species absorb moisture and nutrients through the leaves from rain, dew, dust, decaying leaves and insect matter. Enjoy them on their own or create mini air plant gardens. They come in small, medium and large sizes and some over a few feet in length. They like humid conditions, no freezing, and no super hot and dry sun. Keep them hydrated by lightly misting them, ideally with non chlorinated tap water. Helpful to let water sit for 24 hours, and consider a spray bottle, we sell those as well! Some growers will let them sit in a tray of water for 10 minutes but make sure they dry WELL before putting back into a humid terrarium etc. Use glue to stick them to surfaces and then allow them to grow their air roots! Tips can turn brown, break, scar etc. Don't be alarmed if a branch/leaf gets bent etc. during shipping. These guys will continue to grow, it's just part of the cycle of life! !